Tyler performin wi Aerosmith in Julie 2012. 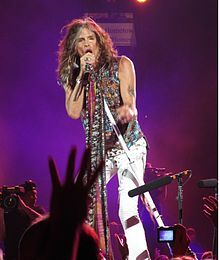 Steven Tyler (born Steven Victor Tallarico; Mairch 26, 1948) is an American sangster-sangwriter, multi-instrumentalist, an umwhile televeesion muisic competeetion judge, best kent as the frontman o the Boston-based rock band Aerosmith, in which he an aa plays the harmonica, an occasional piano an percussion. This page wis last eeditit on 8 Januar 2019, at 21:06.